Star Wars Day is quickly approaching on Thursday, May 4, and if you’re searching for ways to celebrate the annual event, look no further. Do you have a costume in mind yet? Once you’ve picked out your finest space-hopping outfit, find an event in your area and start partying. We haven’t even begun to see all that Star Wars Land at Walt Disney World’s Hollywood Studios is going to offer, and you can visit now to get a Star Wars fix on May the 4th. Ride Star Tours, take in the “Star Wars: A Galactic Spectacular Show,” or have an encounter with Kylo Ren or Chewbacca. Legoland is holding a Star Wars Days celebration from May 6-7 and May 13-14. The Lucasfilm-authorized event will feature famous Star Wars scenes recreated with Legos, costumes, Star Wars building activities, and more. Take in all the Star Wars experiences that Disneyland has to offer. Conquer Hyperspace Mountain, see younglings testing their lightsaber skills in Behold the Jedi training, visit the interactive exhibit in Star Wars Launch Bay, and catch the new 10-minute film, “Star Wars: Path of the Jedi” in Tomorrowland. The New York Philharmonic is granting “Star Wars” fans early access to the “Star Wars Film Concert Series.” By going to the David Geffen Hall Box Office at 10am, you can purchase tickets ahead of the general on-sale at 12pm. Entertainment and free ticket giveaways are also included in the early access celebration. Keep the celebration going all the way through September. The “Star Wars Identities” Exhibition is open now through September 3, 2017 at London’s O2 arena. Guests receive a smart technology bracelet and a lightsaber and design their own Star Wars hero. The collection features over 200 costumes, props, models, and more from the films. 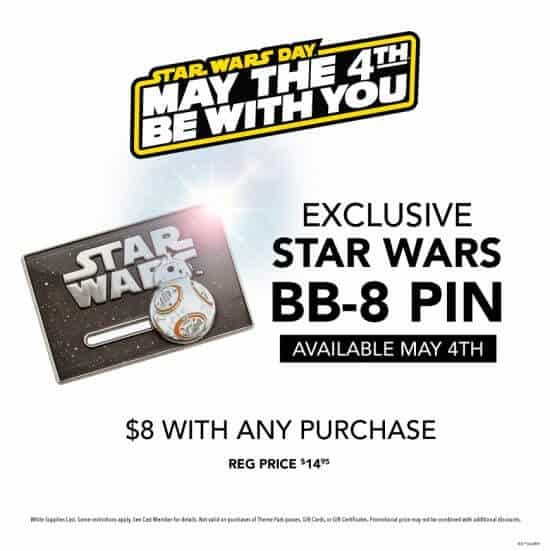 An exclusive “rolling” BB-8 pin will be available for $8 with any purchase (or for $14.95 on its own). Guests can participate in a Force-powered opening ceremony, train to fight the Resistance with BB-8 and Chewbacca, listen to an “Escape from Jakku” story time, and learn to draw droids from the “Star Wars” saga. An exclusive buildable R2-D2 will be included with purchases of $50 or more. Kids can also participate in Star Wars speed-building contests. Winners will receive Darth Revan minifigures, and all participants will get a Hoth Han Solo. Going to events isn’t the only way to celebrate Star Wars Day. Check out these options that let you show your Star Wars spirit from the comfort of your own home. Amazon has a selection of May the Fourth deals on toys, collectibles, and movies, and some are available now. Toys “R” Us is offering discounts on Star Wars merchandise and will also be hosting a nationwide building event in stores on May 6 from 12-2pm. Guests can build and take home a Micro Leia. Cook up some Star Wars-themed food, like Princes Leia Nutella Buns. Try some blue milk with Stormtrooper marshmallows. Watch a full day of “Lego Star Wars” content on Disney XD. 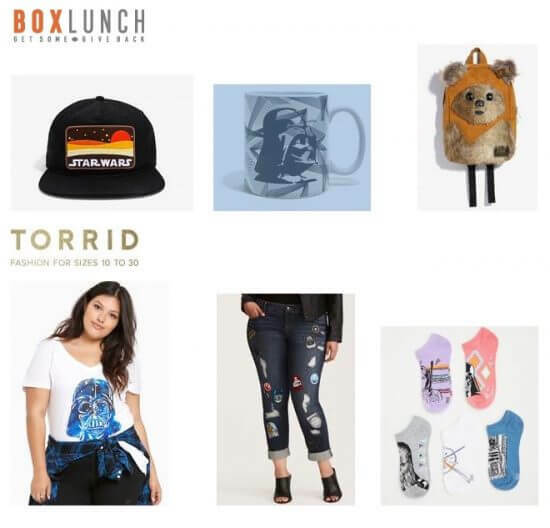 Purchase exclusive May the 4th merchandise from online retailers Box Lunch and Torrid. We can also expect to see some new Star Wars merchandise rolling out this week, some of which was previewed in a panel at Star Wars Celebration. How will you be celebrating Star Wars Day this year? Are there any special events in your area that we missed? Let us know in the comments! There is a May the Fourth Be With You event at The Monkey Club in Philadelphia featuring movies, drink specials, and chocolate Death Stars!